This salad screams SUMMER! Enjoy! Israeli couscous is larger than regular couscous, but if you can't find it, use the regular. I've also used acini de pepi pasta with great results. Dovetailing tip: Slice 2 pounds of extra strawberries. Sprinkle with 1/2 cup of sugar, cover and place in refrigerator. These are used in Meal 3's Donut Strawberry Shorcake. 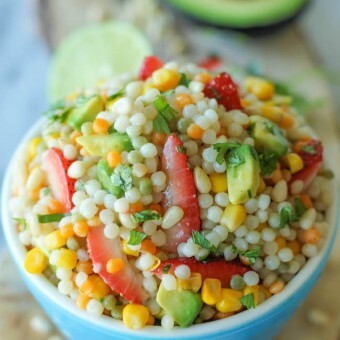 In a large bowl, combine couscous, avocado, corn, strawberries, cilantro and pine nuts. Stir in lime vinaigrette.